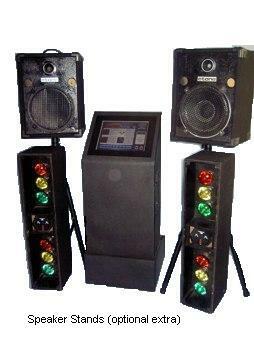 JukeBox & Karaoke Machine Hire in Sydney | CD, Digital Jukebox and Karaoke Machine Hire available. Latest digital technology, jukebox has touch screen song selection, microphone, remote control of volume and skip functions, flashing lights that respond to the music, I Pod lead and 2 x speakers. View More Info / Book Now! Traditional style jukebox with a very attractive, authentic front cover lit from behind with flashing lights and chrome grill. It has a powerful amplifier with speakers at the base of the jukebox. The system is supplied with a microphone and an I-Pod lead. Console style jukebox with touch screen selection, 19" LCD TV, 3 x microphones, flashing lights and 2 x speakers, an I Pod lead, a remote control for volume and skip. There is an extensive library of both Jukebox and Karaoke songs including recent popular songs. The TV displays the words to the karaoke track - (it is usually positioned in front of the singers so they are facing the audience), the words change colour as the song progresses - there is some vocal assistance usually in the chorus of the song (otherwise you are on your own) . FREE DELIVERY - Sydney Metro from Palm Beach to St Clair to Campbelltown to Wollongong to the Sea!